Melynda Van Zee's vibrant and colorful paintings are focused on inner landscapes, unseen realities, and spiritual explorations. She has been painting and sharing her love of art for twenty years. Melynda is the author of Painted Scrapbook Pages (Lark Books) and her work has been featured in diverse magazine publications. She earned her BA in Elementary Education and Art from Dordt College. Melynda has spent years in classrooms, art camps, community art centers, and retail stores teaching about art, spirit, and creativity to children and adults. She now creates in her home studio located in Pella, Iowa in the midst of love and chaos with her husband and three boys. "My paintings are a brief glimpse in vivid color of the emotional and spiritual landscapes of my soul. My work is created with gestural lines of acrylic polymer medium overlaid with multiple layers of translucent acrylic paint on stretched canvas. 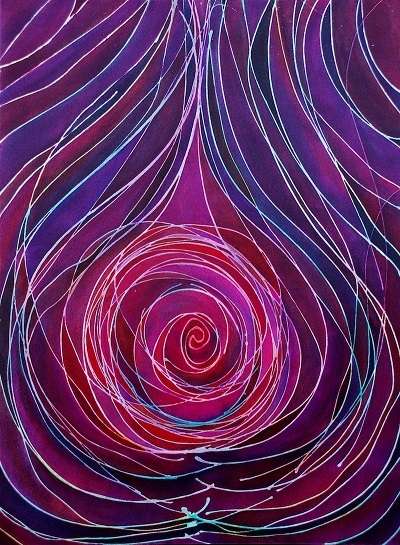 I am inspired by the challenge of intuitively transferring the invisible into shape and form and color. My artwork arises out of quiet reflection and internal observations. My goal is to dedicate myself to ongoing creativity and to inspire others to live a passionately creative life."